The router connects the computers in a network and can for example allow several computers to share a single broadband connection. 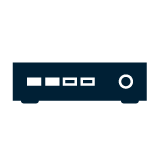 Routers, with or without built-in modem are available, these can be found in the category ADSL products. Prices from 61 shops in this category. This category is also known as Internet Routers, Network Routers or WiFi Router.